‘How to make your own color palette’ can sound difficult, right? Well, I am part of a lot of different polymer clay groups on FaceBook. Some I am more active on than others, and some I just lurk. Last week, someone asked how to make a color palette. There were lots of ideas thrown out, many of which were great. Most of my items are made from custom color palettes that coordinate. Making your own palette is easy and the more you do it, the easier it gets. 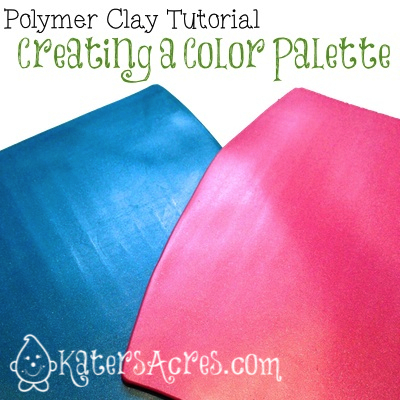 There are lots of ways to make your own color palette, but this is the method that I prefer. I know this idea is not new and I know it did not originate with me [or as a matter of fact anyone in the polymer clay world or community]. Why do I say that? Because it is modeled after basic painting techniques and basic color theory of blending one color into many colors to achieve a harmonious color balance. This color concept is not new and has been around for centuries. Painters do it all the time. This being said, I do not know who the first polymer artist was to adapt this color theory and painting technique to clay; I do know I am not the first. In order to make a perfectly coordinated color palette, you must start with the basic colors you want in your palette. For the example I have shown at right, you will see that I have used two different colors of clay. Although these colors of clay look nice together, they are not coordinated, they could be better matched. Start with the amount of color you’d like to use for your project. I am using 1/4 of a block of Premo! Peacock Pearl & Premo! Metallic Mauve. To each color in your palette, add the SAME color to each of the other colors (I have chosen Premo! Copper). NOTE: Due to a clay color’s saturation (the amount you need to add may vary). Blend completely (partial blend is shown in bottom right) until a non-streaky, harmonious color is achieved. When you have finished with all your colors, you will have a perfectly coordinated blend that will look gorgeous together. You can use this method for just 2 colors (as I have shown) or as many colors as your heart desires until you have a gorgeous palette that looks like it was born to be together. I think it was Marie Segal.